Keka ( Kekei ) Nalavala - meherbabatravels jimdo page! Died : 10th February, ? Noasherwan ( Anzar ) is the editor of Glow International magazine. Mahrukh is the treasurer of Glow International magazine. In 1952 while I was in Kanpur on company business, I learned that Meher Baba and His mandali were travelling from Hamirpur to Jhansi, so obtaining leave from my boss, I boarded a train for Jhansi. Meher Baba was very happy to see me and invited me to a devotee's house where we all had dinner. Then on Meher Baba's order, I returned to Kanpur that very night. This is how my contact with Him multiplied but it was solely due to His grace and nazar on me that I was again brought nearer to Him. In the following year of 1953 Meher Baba returned to Dehra Dun for a stay and a public darshan programme as well as for His own spiritual work and mast tours, and on the day of His arrival I had the honour to serve Him food cooked by my wife and Sheroo. On this visit I got so close with Meher Baba that if I failed to pay Him a daily visit, He would send someone to ascertain the reason why. One day Meher Baba ordered all His men mandali and myself to repeat a chosen name of God during the whole night. I chose "Ahuramazda" and started the repetition standing in a corner of a room in the mandali's bungalow, but after midnight I fell into some sort of semi-unconscious state and began to shout Meher Baba's name while tears filled my eyes as I pleaded that He should come to me. The next morning the mandali complained to Meher Baba about the disturbance I had caused with my loud lamentation, but Meher Baba saw it differently. He said that I had been acting sincerely as my conscience had driven me. One of my pet aims was that my association with Meher Baba should be recorded in a movie and though I realized all the time that it was a childish wish, Meher Baba did not fail to read me internally. So to my great joy and surprise, He came to the book-stall which was in my charge at the time of mass darshan and got the movie-makers to take a nice shot of Him holding my hand as we emerged from a room heading towards a pandal. My reason for mentioning this small item was to show how Meher Baba works even for a man with a silly aim, no less than for the person with a real and true purpose. He exposes the silliness of a man, not by threats, taunts or discouragement but by opening His eyes to unimportant choices. During this same year, in the month of October, after selecting one person from each of the main religions, Meher Baba instructed them to sit in their respective prayer houses for the purpose of saying prayers or some expressions dictated by Him, to be repeated one hundred and one times. I was selected as the Parsee representative but the site chosen by Meher Baba for me was to be a Parsee burial ground. The assignment for all was to last for seven days from midnight to 2 a.m. Although I had assured Meher Baba that I was not afraid, the calm and dreadful atmosphere of the cemetery did distract my concentration and more so when at one point there was a noise of footsteps walking in the sand. My fear deepened as I remembered the account of a certain Parsee individual who had been buried in this cemetery without the blessing of the usual Parsee ceremony and I thought that his ghost had come to torment me. However, gathering my nerve I persisted with my prayer and soon I sensed that someone was standing beside me. Then turning my head, I discovered to my amazement that it was Meher Baba Himself who smiled and signaled that I should continue. I cannot forget the exhilarated feeling that possessed me as Meher Baba stood with me before the portrait of Zarathustra and continued to join me in prayer for the next half-hour before leaving. God and His tiny creature praying before His own first avataric form of Zarathustra — what an unbelievable but glorious spectacle ! On the seventh and last night, Meher Baba acted similarly at all the other prayer houses and performed in the manner of the followers of the different faiths. I can only hazard a guess that in this phase of His work, His message was, "I belong to no religion, but all religions are mine." Once a funny incident took place which resulted with my acquiring a nickname. Baidul was giving a talk in English before Meher Baba and He opened with a reference to my ambition to be the boss of the Company for which I was working. However English was not his native tongue and he pronounced the word "boss" as "bose" which amused Meher Baba so much that He had Baidul repeat the word. Thereafter the mandali began to call me "Bose" and Meher Baba did too but regrettably I never achieved the distinction I aspired to in the Company for unfortunately early in the following year my services were terminated when Singer Sewing Machine Company decided to close down their operations in India. When I informed Meher Baba about the loss of my job, I also took the opportunity to tell Him about my plan to start my own business. I received a very heartening reply by telegram which stated: "Don't worry. All will be well. God is Malik" which was followed by a postcard that read: "Have no fear at all. Our God is Almighty. He is the Lord and He will make you dance according to His wish. You must start your new business without a second thought or any worry, just as you said in your letter. Why don't you become the ‘boss’ since my nazar is on you? What are you afraid of? Have hope, have courage, be courageous and carry out your work successfully. Where there is honesty and purity of heart, there is God, so don't give up His company. Why are you worried about old age now? You have to grow young now. Do not be afraid. The plan you have outlined should be put into practice and get ready to be the ‘boss’. Whatever gifts I received from Meher Baba were always considered the "best" but one that was especially prized was when He called me one day and presented me with a three-piece winter suit which He had worn while touring the West. How can one describe the emotions that went with the possession of this intimate apparel of God? India is a country where cricket, introduced by the English, is a national sport and it was a pastime which Meher Baba indulged in during His school days. As Avatar, He still retained a taste for the game and so He once asked me to secure the implements for a match. Fortunately I was able to scrounge what was needed, some pieces borrowed from my son Naosherwan's set. Meher Baba played many games of cricket with the mandali while in Dehra Dun and I was always fortunate to be invited to participate. The Singer Sewing Machine Company closed its operation in July 1954 and as I had mentioned, with Meher Baba's blessing I opened my own business after securing the agency. A little while later, I received the following postcard from Eruch on Meher Baba's orders: "Meher Baba says it is okay you are now the "boss" but when you have a free moment, you should write to Him about your well-being and that of your wife and children. Meher Baba asks, ‘Don't you have a single moment to remember Baba?’ He has been awaiting a letter from you since the beginning of August and when He did not hear anything from you, He decided to write to you today. Meher Baba says, ‘If nobody remembers me, at least you would try to remember me and drop me a line now and then. It will make Baba happy. ’ Why does Baba always have to remember everyone? Then what good are you all?’"
When my daughter Mahroukh was married four years later in Navsari, Meher Baba sent Khorshed Irani, one of His women mandali with a lamp as His wedding gift on which was inscribed the words "Love God." So close He was and will ever be with my family. In 1965, my son Naosherwan and I were with Baba at Guruprasad Bungalow in Poona and Baba being aware of Naosherwan's asthmatic condition, gave me a sum of money and sent me to a well-known doctor in the area with instructions that Naosherwan should be examined from head to toe. When I told Meher Baba afterwards that I had the money to pay both for the doctor and for the medicine he had prescribed, Meher Baba reminded me that His money gift was more than what I had considered it. "It is my prasad," He said. Around that time, Naosherwan who was studying for His B.A. examinations, developed a strong urge to leave home and College in order to find some place where he could think of Meher Baba, perhaps even join Meher Baba's mandali. The dislike for the world that was sprouting in him and his growing thirst for things of a spiritual nature began to show itself in his strange behaviour. He started striking his Head against the wall. All of this, which at the time was kept hidden from me but was known to his mother, so alarmed her that she frantically sought Meher Baba's help by describing in long telegrams what was happening. In equally long telegrams and in a letter Meher Baba replied that Naosherwan should continue to attend College and leave the result of either failure or success to Him. When the time is ripe, Meher Baba added, Naosherwan will come to Him but as far as renouncing anything in life is concerned, Naosherwan should just renounce his present attitude. He should also take care of his parents and if he did not really want to continue his studies, then he should find some suitable service. Finally, Meher Baba emphasized that Naosherwan should himself reply stating that he understood and would obey Meher Baba's advice and instructions. Naosherwan was so greatly impressed that he followed Meher Baba's instructions, went back to His studies and secured a post-graduate degree in English, thus relieving my wife and myself of our worries that He might go astray through wrong contacts with other saints or sadhus (I will let Naosherwan narrate the details at another time). A little later in that same year of 1965, Naosherwan conceived the idea of publishing a magazine devoted solely to Meher Baba, who encouraged him and chose THE GLOW as the name of the magazine which to this day is still alive, growing bigger and bigger, carrying Meher Baba's name and messages to every nook and corner of the world (this year GLOW INTERNATIONAL celebrates its 30th Anniversary). In December of 1968, the aforementioned Shatrugna's daughter, Amrit, married Meher Baba's nephew, Dara Irani, and at Meher Baba's bidding, Shatrugna invited my wife and me to the wedding which took place at Meherazad and Meher Baba found the time to call us near the verandah where He was seated so He could talk with us and bless us. That was our last darshan as it was for Naosherwan for whom Meher Baba arranged employment with India's national newspaper The Times of India. The next and last time I saw Meher Baba was when He lay in the open crypt on Meherabad Hill. It was on the seventh and last day before the body was entombed at the end of the first week in February 1969. Meher Baba is no more in the body so physical darshan is a thing of the past, but whenever members of my family are in any trouble or are worried, we feel His presence near us for we have learned to take His name continuously. I fully realize that there are others who cannot believe or accept that Meher Baba was God in human form, but to our family He is indeed the Avatar of our age, the very personification of love and compassion and undoubtedly the perfect spiritual guide for all humans who are in search of Truth. ALTHOUGH Keki Nalavala was a resident of Dehra Dun and already loved Meher Baba, he was not permitted to see Baba and had only seen Baba's feet once a year ago – that too from a distance. Keki Desai of Delhi had likewise come to meet Baba in Jaipur in 1941, but had not been allowed even to see his feet. Baba's coquettishness, however, served its purpose, and on Chanji's request Baba agreed to give darshan to the two Kekis in the mandali's bungalow, but only for one minute. They came on April 14th, along with Adi Noras, a friend of Keki Desai whose residence was in Navsari but was working in Dehra Dun. They were warned beforehand neither to fold their hands, garland, bow down to or speak to Baba. They were led to Baba's small ten-foot by ten-foot room. As Keki Nalavala recalled: "We were made to stand before the small curtained room as stage actors stand on the stage before the curtain is lifted." At exactly 2 P.M. the curtain was drawn aside revealing Baba sitting cross-legged in a corner with Jal Kerawala. MARCH 10, 1950 – NOT ONE OF US COMPANIONS CAN MAKE HEAD NOR TAIL OF IT. Again, on the morning of March 10th, at 7:15 A.M., Baba, with the four companions, Gustadji, Baidul, Pendu and Eruch, proceeded by bus to Rishikesh, where he trekked through the mountainous terrain for almost five hours and contacted one hundred and thirty-five holy men – bowing down to different saints, sadhus and mahatmas. He and the companions returned by bus to Motichur at two o’clock that afternoon. Every sojourn was proving to be more and more trying. Keki Nalavala was given the work of bringing patients to Donkin. He once brought his wife and children for an examination, but Baba asked Donkin not to take any fee from him. Next time, Nalavala brought an elderly, poor woman for treatment. Whatever Donkin spent on her, Nalavala only paid him a fourth of the expense. Donkin had opened his practice ostensibly to support the companions but, instead of earning, he was obviously losing money. Whatever afflicted persons he accepted, he would attend to thoroughly. He cured several supposedly incurable patients – but at his own expense. As far as Baba’s New Life goes, not one of us companions can make head nor tail of it. Even the third-plan people now with Baba do not expect to be there long, and Baba has openly told them that he does not want them with him. It is all a mystery, a mystery and again a mystery, and very difficult for those who are with Baba and those away from him. Lord Meher, 1st. ed., Bhau Kalchuri, Vol. 10, pp. 3567 – 3568. Back in Dhera Dun, while conversing with the mandali one day, Baba explained to Kishan Singh: "To a freight train are attached many wagons. Some contain good material, some bad — iron, copper, oil, waste products, et cetera — in different wagons. But, whether it is good material or bad, when attached to the engine the carriages go where the engine goes. The engine does not carry wagons of only good things, leaving the bad behind. Similarly, I am like an engine, and those who remain attached to me reach their destination, whether they be virtuous or vicious." Keki Nalavala asked, "But how do we remain attached to you?" Baba replied, "The meaning of remaining attached to me is to follow my wishes, to remember me and to forget your selves." Kumar said, "This is an impossible thing, Baba! This type of joining depends on your grace." Baba replied, "If you try, you will be deserving of my grace. I am the Infinite Ocean of Mercy and to shower mercy is my nature. If you throw sandalwood or filth in the ocean, does it have any effect on it?" "There is an abundance of fresh water in the ocean and it does not give out fragrance if roses are thrown in it, or stink if garbage is dumped in," Kumar replied. Baba stated, "The ocean absorbs within itself heaps of sandalwood or refuse, good things or bad, as it is unlimited. Similarly, if you throw your good and bad actions upon me, absorbing them, I will free you from all bindings. But the meaning of throwing or dedicating to me is that you should thereafter completely forget such actions, because to remember them is not true dedication. It is in the nature of things that every life will have an eventful turn which for me came to pass in 1938 when I ran across an old friend from my native Navsari who had been a school mate years before. In those days, Keki Desai had already known about Meher Baba but His life was hardly a mirror of what Meher Baba expected of people. Yet strangely, His faith in Meher Baba persisted to the point that He would always call upon Him for deliverance whenever misfortune in any form befell Him, and He even extended His pleas to include me when I was beset with my own difficulties. Now I had heard about Meher Baba before Keki Desai mentioned His name to me because some eight years earlier when I was on leave from my job in Dehra Dun where I also lived, on a visit to Navsari I took the opportunity to call upon my old schoolteacher, Mr. Behramji Desai and it was He who first asked me if I knew anything about Sadguru Meher Baba. When I answered negatively, He gave me a small book titled "The Sayings of Meher Baba" which I read with little interest for I was deeply steeped in the cultural and religious beliefs of the Zoroastrian faith. At the time of my meeting with Keki, I was suffering from a physical infirmity which drove all thoughts of spiritual matters out of my mind, but Keki imbued with His faith in Meher Baba as the dissolver of all difficulties, succeeded in getting me to write Him a letter about my condition. Not only did I not receive a reply from Meher Baba or any of His disciples, but my troubles continued to mount during the next year or two so that I taunted Keki about His All-Knowing Meher Baba. However Keki encouraged me not to despair, that it was all a matter of time and that I should try to keep my faith in Meher Baba. He also sent me books and circulars which enabled me to learn more about Meher Baba. In 1941 I first began to feel that the seed of love for Meher Baba was now planted in my soul, so much so that the excitement of this discovery led me to enthusiastically discuss Meher Baba with members of my own family and with Freiny, the young lady to whom I was then betrothed. Not unexpectedly, they were not impressed as they were already familiar with the criticisms which had been penned against Meher Baba by people such as Paul Brunton, Colonel M.S. Irani and Major Sohrab Bamji who happened to be Freiny's uncle. However their opposition did not change my mind and in time Freiny came to a better understanding of Meher Baba and with it a change in her attitude. Things seemed to be going well when in 1941 Meher Baba and His disciples decided to camp in Dehra Dun and it seemed that this might be my first opportunity to meet Him. So with my uncle and without an invitation, I went to the bungalow where Meher Baba was staying but to my dismay was informed that He was seeing no one. All I got for my effort was an incidental glimpse below a curtain that hung over a doorway, of His feet stretched out on a gunny bag that served as a carpet whenever He sat on the floor. And although Kaka Baria, one of the disciples, appealed to Meher Baba on my behalf, His response was a flat refusal and a request that I should be told He was not seeing anyone but that His nazar and blessings were on me. It was better than nothing but my faith wavered momentarily as I thought over the strange behaviour of this so-called saint who had refused to see a human being for whose sake He had taken a human form, and whose disciples gave me blandishments that seemed rehearsed for all unwanted visitors. Nevertheless, somehow what I gradually received from three of the disciples, Kaka Baria, Framroze Dadachanji (Chanji) and Behramshaw Jessawala (Pappa) who had taken a fancy to me, eventually prompted me to seize on opportunities to talk about Meher Baba with other people in Dehra Dun. However it came to pass that in 1942 Behramshaw finally managed to arrange a meeting with Meher Baba for both myself and my friend Keki. He schooled us beforehand on the required protocol for the darshan which was to take place exactly at 2 p.m. and so, much before the appointed time, we fortified our spirits with a couple of glasses of English beer. The meeting took place in a small room to which we were led. "Remember," Behramshaw's voice was heard to say, "no more than two minutes to have His darshan, and no questions. Absolutely nothing but His face to face mulakat (darshan)." Then the curtain that hung around a door frame was raised, and it seemed also the curtain of my mind and my heart, for as we beheld the shining light of the sun in compassionate eyes, I found myself whirling in the space around Him which left me with a peculiar feeling for days afterwards. He blessed us with outstretched hands and then instructed us to leave the bungalow. The love and faith which then seemed to be impressed on my soul, left me with a deep hunger to see Him again. So when I learned that He would be leaving soon by rail on a mast tour, I went to the station platform and was fortunate to catch His eye as He sat in a third class compartment. He pierced me mercilessly with His smile. Then He sent one of His mandali with a message that I should leave the station and that I had His blessings. In 1943 when my wife was in Dehra Dun hospital for an operation and I was filled with worry and anxiety, I decided to write to Him. What I received from His secretary, Framroze, was a most soothing prescription which He had dictated that read: "He is aware of your condition and does not want you to worry about anything. You must follow the doctor's advice for your wife. Baba' s compassionate ‘nazar’ will and has always been on you as well as your wife and children. Don't let anything bother you. Everything will turn out fine. Always remember Him in your heart." In the same year I received a message, also from Framroze, that I was invited to join the congregation in Lahore for the celebration of His birthday, and the fact that He had seen fit to include my name in affairs that He sanctioned, deepened my feelings of love and faith in Him. Meher Baba was back again in Dehra Dun in 1944 and this time His order of seeing no one was enforced to the limit. There was absolutely no chance that I would get to see Him but a great consolation lay ahead although it would take two years to materialize. In 1946 Meher Baba planned another visit to Dehra Dun and to prepare for this He wanted Behramshaw and myself to find a suitable bungalow in Majra which was about three miles outside the town. I also received other detailed instructions to follow regarding transportation and provisions. This was the first time I was entrusted with individual responsibility for carrying out His orders and I was amply rewarded for my effort with the loving hug He gave me on arrival. At the bungalow, He drew me aside, keeping His gracious hand on my shoulder and patting me lovingly, made me understand that He was God, that He was in everything and that even a small insect was guided by Him. He told me to love Him more and more, to be honest and never to worry as He would worry for me, and that I should come to see Him each day to sit with His disciples without however neglecting whatever duties I had at my place of employment. One day He gave me a very special and unusual order. Within the period of one week I had to find five persons who were neither very rich nor very poor, but from middle class families who were too proud to beg for food, clothing and other necessities which were lacking in their lives. Although I made every effort from morning until dusk, I did not succeed and when I reported my failure to Meher Baba, He patted me for trying and graciously gave me another week for the task. Promises were given to me by some people and then they were broken, so it was still a disheartening business. Fortunately though on the very last day, I had managed to collect the required five individuals whom I hurried into a tonga and rushed to Meher Baba's abode just in time to meet the 11.00 a.m. deadline which He had given me. Meher Baba then took each person, one at a time, into a small room, closed the door behind Him and did whatever work He had in mind. Two came out with tears in their eyes, two were smiling and the fifth said nothing and showed so signs whatever. Meher Baba said afterwards that He was satisfied, that His work was done and that the individuals had fitted His needs. I can truly say that through this mission, Meher Baba had succeeded in making me less of a shy person and had imparted to me a feeling for positive action and faith in my ability to get things done. Following this, after a few days had passed and having learned that I had written a story for a magazine, Meher Baba asked me to take down some points from Him for developing a story depicting the difference between spiritual and material love. The story was eventually accepted by a Bombay magazine which turned out to be the same publication which had printed some of Meher Baba's ghazals when as a teenager He used the nom-de-plume "Huma". Very often Meher Baba used to inquire about my health and the health of my immediate family and particularly about my wife's then pregnancy. The reason we later grew to understand, was His keen interest in the child who grew up to be His future worker and ardent lover. Meher Baba was very happy when I eventually carried the news to Him that a son had been born and that he had been given the name Naosherwan. When Naosherwan was two months old, that is, in November 1946, Meher Baba graced my home by coming to lunch with four of His disciples. 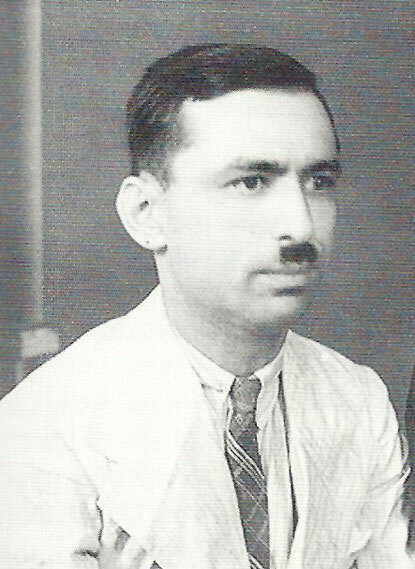 After lunch, while He was resting, He had infant Naosherwan all the time in His divine hands and it is fitting to record that when Naosherwan grew up, his first book of poetry about Meher Baba was titled "In Lap of Love," reflecting the sense of love Meher Baba had undoubtedly imparted to Naosherwan. That wondrous visit climaxed by having Meher Baba's photo taken with me standing beside Him outside the front door of the house. Even my wife had her own special darshan from Meher Baba for when He left on November 30, He asked her to prepare plain rice and dal for Him with the specific instruction that she should do the cooking in complete silence and with head covered. Thus 1946 was a year when my life had one of its most significant periods and since that time Meher Baba became my Father, Mother, Friend and spiritual guide who always came to our rescue whenever troubles arose. Meher Baba seemed to have a special liking for Dehra Dun. In 1949 during the era of His New Life phase when Meher Baba's caravan was heading towards Dehra Dun, I received a request from Him to search for and purchase a suitable piece of land with house and amenities that would be used for His stay. The place had to be a few miles outside the township and together with my old friend Keki Desai and a local man whom we selected, the search began. On bicycles and on foot we trekked up and down and all around and after a few days of painstaking exploration, we came to a village called Mafi Majri and seemingly by chance happened to meet a villager named Shatrugna Kumar who joined forces with us in looking for the piece of land that would fulfill Meher Baba's needs. Shatrugna was a man with an interesting background. He was an honourary magistrate, and had been a revolutionary working for India's independence for which activity he had been imprisoned by the British, and he was a profound atheist. When He first learned that Keki and I were working for a saint whom we accepted as Avatar, He laughed at our notion but nevertheless did not hesitate to help us. Yet he took some interest in what I began to tell Him about Meher Baba, and my gift to him of Charles Purdom's "The Perfect Master" apparently put him in some mood of eagerness to meet Meher Baba. In due course Meher Baba arrived with His party of disciples in January 1950 and the arrogant atheist was introduced to Him, but whatever it was, Meher Baba's ways were sufficient to have kindled a fire of love in Shatrugna's heart for he began to obey all of Meher Baba's orders. Gradually Shatrugna turned into theist and believed Meher Baba to be God in human form. We did not know it at the time but Shatrugna had had an earlier but unconscious link with Meher Baba. While he was in prison, with much time for reflecting on his life and with a burning desire to rejoin his revolutionary comrades, the atheist Shatrugna one night prayed in His own unschooled way to a God in whom he did not believe and vowed that if he were released on the following day, he would take it as a sure sign that God indeed existed and he would look at life differently. Well it so happened, for reasons no one could follow, an order came for his release the next morning and when Meher Baba reminded Shatrugna of this incident of which only Shatrugna had knowledge, it fortified his willingness to accept Meher Baba as the All-Knowing God to whom he had prayed. 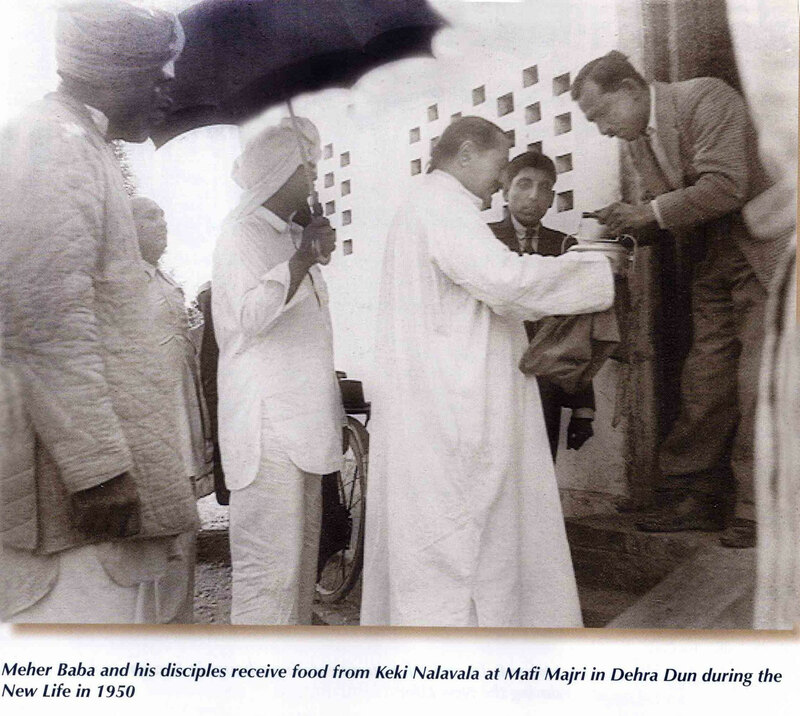 While Meher Baba was staying at Maafi Majri, another opportunity for further service to Him was given to me when Meher Baba instituted a phase of begging for food. He wanted to eat only the food offered by a lover and so I was selected to prepare His food and take it to the places He designated where He would collect it. On one occasion He also requested that my wife and my business partner's wife Sheroo Chacha, do the cooking. Apart from this He also instilled in me a deep sense of punctuality and obedience by ordering me to be present every morning exactly at six o'clock to read the daily morning papers to Him. If I happened to be late, there was certain to be a messenger from Him with a note of reprimand but I understood it as a part of the training I was receiving from Him due to His love for me. My services did not end with the aforementioned. In His New Life all the disciples were at this point asked to earn money to feed the group and to meet other expenses necessary for the upkeep of the camp. Some were sent to Delhi to Keki Desai's residence to manufacture butter with the help of a lover from Aligarh and they achieved a measure of success. Similarly, Dr. Donkin was requested to open a dispensary and my task was to find not only the building but also the patients. Dr. Donkin was told to treat me and my family for free but since in the end the patients were too few, Meher Baba asked Dr. Donkin to close the dispensary which was then renovated under my supervision for Meher Baba's further use. Unfortunately my knowledge of masonry work was nil and the hearth which was constructed received unfavourable comment from Meher Baba. On one of His mast tours, Meher Baba permitted Keki Desai and myself to accompany Him and the mandali and after setting up camp at Motichur, we were asked to uproot all the grass in the field and erect a small hut where Meher Baba spent time alone while we remained outside as guards. After dinner the same night, Keki was told to go to Delhi and I was to return to Dehra Dun, but how fortunate I was that Meher Baba with a torch in His hand, had come up to the railway track that passes through Motichur in order to wave goodbye to me. I became so much attached to Meher Baba in that year that I could not see how I would be able to bear the inevitable separation when the time came and it expressed itself in incessant weeping as I stood on the railway platform on the day of His departure. He requested me to stand close to Him until the train left but even that consolation was not enough to hold back the copious tears which fed my craving, echoing internally and silently, "Come back." 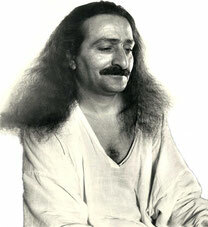 Truly, Meher Baba was the Ocean of Love. I found Keki too was present. After a few questions about my health, Meher Baba surprisingly ordered me to shake hands with Keki three times and then to embrace Him. Following that little scene, Meher Baba embraced both of us and then directed us to leave the room. What the significance of all this was, I had not the slightest idea but I believed only Meher Baba knew and He gave no explanation. I know only that we are closer to each other than brothers and that this relationship is deeply stamped in our hearts (Keki Desai passed away last year). It was during this time that I had my first opportunity to meet Meher Baba's sister, Mani. Since I was very familiar with Singer sewing machines, a company I had worked for a number of years, Meher Baba took me at noontime one day to the bungalow where He was staying with the women mandali, so that I could demonstrate how hem stitching was done. Now "All work and no play" is never the routine for Meher Baba, so tiring with the work of meeting people, Meher Baba selected a few individuals including myself to plan a variety show which was to include songs, jokes and skits. The overall theme was to be laughter to amuse, not pathos to deaden the spirit. I was given a part in a skit with Minoo Kharas and Baba's brother, Jal, and since I had no acting skills, I received some tutoring in this art for about two hours. We were proclaimed the best during the two-hour long show and Meher Baba's laughter made us all feel very happy. At the end Meher Baba gave every performer a Baba locket and a warm embrace.